~ updated on August 15, 2017. Milk replacer characteristics can influence how it interacts with automatic calf feeders. These interactions affect how the milk replacer behaves in the feeder and may also affect calf performance. This post explores how the physical characteristics of milk replacers, solubility, mix temperature and formulation come together with automatic calf feeders. Most milk replacer manufacturers in the US use protein-encapsulated fats rather than simple fats. By themselves, fats are not soluble in water. Making an encapsulated fat involves heating, mixing, homogenizing and spray drying what is basically a mixture of fat, protein and emulsifiers. This forms very small fat particles which become encapsulated with proteins. With the fat hidden inside. the protein coating readily interacts with water, allowing the protein-encapsulated fat to go into solution. Mixing and feeding usually occur simultaneously with automatic feeders. Very little cooling occurs between mixing and feeding time. 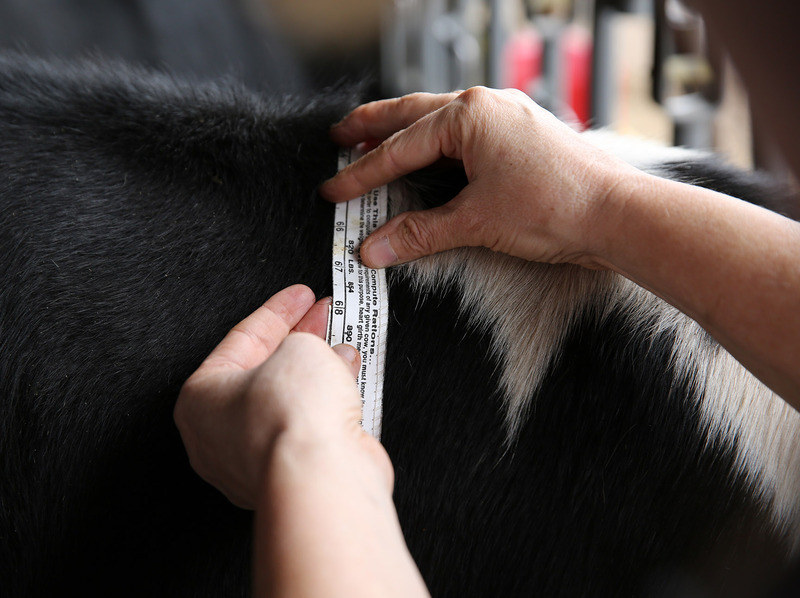 To remedy this, mix milk replacer between 100 -105 degrees F. This is a lower mix temperature than you will typically find listed in most milk replacer instructions, which is usually between 110 – 120 degrees F.
This temperature discrepancy should not generally be of concern. 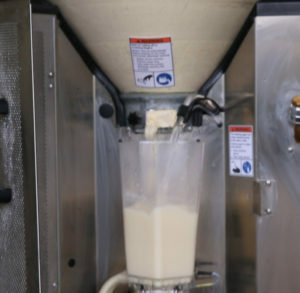 The fats used in most commercial milk replacers melt between 90 and 100 degrees F and the mechanical mixing action of the feeder facilitates solubility. Of course this assumes that the mix temperature of each unit is correct. Low mix temperatures can affect solubility, digestibility and animal performance while high temps can discourage calves from drinking. A 2012 study by Virginia Tech of 10 dairies in Virginia and North Carolina with automatic calf feeders showed a range of mix/feeding temperatures from 81 – 118 degrees F. These data point out the need for routine mixing temperature monitoring throughout the year, making any necessary seasonal corrections. Milk replacer formulations vary considerably among farms using automatic feeders. The table on the right shows that the 10 farms in the Virginia Tech study fed six different formulations. The best milk replacer formula for any one farm actually depends on the feeding rate and the farm’s growth objectives. Feeding rates with automatic feeders are typically between 1.5 to 2.5+ pounds of milk replacer powder per day. 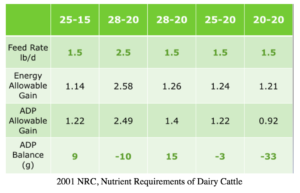 Calves on higher feeding rates usually benefit from higher protein formulations while calves receiving a more traditional amount of milk replacer may benefit more from a more standard formulation such as 20:20 (% protein:% fat) or a 22:20. The table below demonstrates how the milk replacer formulation works with feeding rate to affect gain. Values were derived from the 2001 NRC Nutrient Requirements of Dairy Cattle ration program. 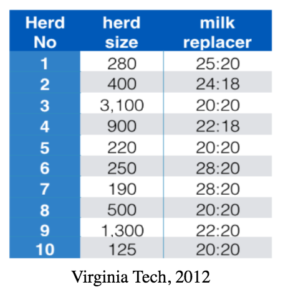 Consider the 28:20 in the second milk replacer column with a feeding rate of 2.5 pounds powder/day. The Energy Allowable Gain of 2.58 pounds reflects the potential gain provided by the energy consumed. ADP Allowable Gain of 2.49 pounds is the gain supported by the amount of protein consumed. In this case, ADP Balance is -10, indicating there is not enough protein to convert the available energy to gain. Maximum gain, therefore is 2.49 pounds per day, not 2.58, since protein is limiting gain in this case. You would need another 10 grams of protein to match the energy provided by the milk replacer and turn it into gain. The extra energy in this scenario will go toward production of body fat. Compare this to the values in the next 28:20 column where the feeding rate is 1.5 pounds per day. The lower feeding rate means lower energy intake, limiting gain from energy intake to 1.26 pounds per day. Finally, take a look at what happens when you feed a 20:20 at 1.5 pounds per day. Potential gain is only 0.92 pounds per day. All that extra energy goes toward body fat. When choosing a milk replacer, it’s important to pick a formulation that matches your feeding rate and growth objectives. Most milk replacers used in automatic calf feeders are manufactured with all-milk proteins. This is typical of milk replacers designed for high feeding rates. Nonetheless, milk replacers containing non-milk proteins such as animal plasma and a wheat & plasma combination are being fed successfully through automatic feeders. At high feeding rates you may want to check with the manufacturer to assure that non-milk protein inclusion levels don’t pose a concern when high volumes of milk replacer are fed. Automatic calf feeders can all do a good job of mixing milk replacer, but there are differences in mixing equipment. Some use less force or a shorter mixing cycle than others. These feeders may be a bit more sensitive to differences among milk replacers which may result in some undissolved powder after mixing. In addition, milk replacer powder attracts moisture which changes its storage and mixing characteristics. Practices such as transferring milk replacer powder from the original bags to a storage container can greatly increase exposure of the powder to air and moisture. Filling a 150 pound hopper with milk replacer powder to feed for several days may unnecessarily expose the powder to moisture. Combining higher moisture with the weight of the powder can cause it to compact. This can lead to bridging and flow issues. A more appropriate approach in this case would be to add 50 pound of powder at a time. With a bit of care and attention to details, undesirable interactions between milk replacer and the feeder can be minimized. Feeding Electrolytes: how much does a calf need? © 2019 Calf Sessions. All rights reserved.